ZENworks Asset Management enables you to monitor your organization’s compliance with software license agreements by comparing purchased software licenses with actual software installations discovered during inventory scans. Asset Management license compliance is a powerful and flexible tool. As a result, there are multiple approaches and methods you can use when setting up license compliance. The following sections provide basic instructions with minimal explanation in order to help you quickly set up a single product for license compliance monitoring. After you finish this basic scenario, see License Compliance in the ZENworks Asset Management Reference for more detailed information and instructions. Before you begin implementing compliance monitoring, you need to understand the components involved and how they work together, as explained in the following illustration and subsequent text. You scan the devices in your Management Zone to collect the list of installed software products. These are called discovered products. In the above illustration, the inventory scan discovered that ProductA is installed on 15 devices. You create catalog products to represent the software products your organization has purchased. Typically, each catalog product corresponds to a specific manufacturer part number. In the above illustration, ProductA is the only catalog product. However, you might have catalog products for ProductA, ProductA Upgrade, and ProductB. You create purchase records to represent the purchase orders or invoices for software products. Each line item in the purchase record lists a catalog product along with the license purchase quantity. If a catalog product is listed in multiple purchase records, the catalog product’s total licenses equal the purchase quantity for both purchase records. 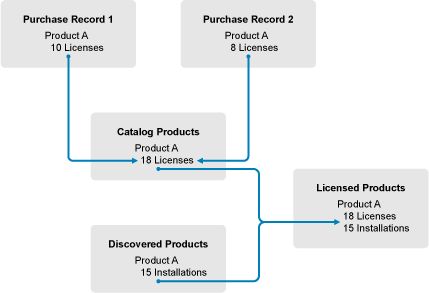 In the above illustration, one purchase record includes 10 licenses of ProductA and another purchase record includes 8 licenses. The total license count for ProductA is 18. You create licensed products and associate the corresponding discovered products and catalog products to them. This gives you a single licensed product that includes the number of licenses and installations for the product. The result is a quick view of whether or not the product usage complies with the license agreement. In the above illustration, ProductA has 18 licenses and is installed on 15 devices, so ProductA complies with your license agreement. If you have not already scanned the devices in your Management Zone to collect information about installed products (referred to as discovered products), complete the steps in Collecting Software and Hardware Inventory. After you have discovered products, choose one whose compliance you want to monitor. In ZENworks Control Center, click the Asset Management tab, then click the License Management tab. In the License Management panel, click Discovered Products to display the Discovered Products list. Browse the list to choose the discovered product you want to use. The product must have a least one installation listed in the Installed Quantity column. If possible, you should choose a product for which you have a purchase order or invoice readily available. This allows you to complete the scenario using real information. Otherwise, you can invent the purchase information as you go. Remember your product choice so that you can use it later. Continue with the next section, Creating a Catalog Product and Purchase Record. Discovered products provide the installation information for products. To provide information about product purchases, you create catalog products and purchase records. A catalog product represents a software product. A purchase record populates the catalog product with the number of product licenses you’ve purchased. The following steps explain how to create a catalog product and purchase record for the discovered product you chose in Discovering Installed Products. In the License Management panel, click Catalog Products. Click New > Catalog Product to launch the Create New Catalog Product Wizard. Manufacturer: Select the software manufacturer from the list. If the correct manufacturer is not listed, type the manufacturer name (for example, Novell, Symantec, or Microsoft). Product: Type the name of the product. The product should represent the purchased software product package (SKU). For example, the purchased package might be Product A Single License or Product A 10-Pack. If you have an invoice record that includes the product for which you are creating the catalog product, use the product name from the invoice. Licenses Per Package: Specify the number of licenses included in the product package. Product Type - Notes: These fields are optional. You can use them to further identify the product. Excluded: Do not select this check box. Click Next to display the Summary page, the click Finish to add the product to the Catalog Products list. Click License Management (in the breadcrumb path at the top of the page) to return to the License Management page. In the License Management panel, click Purchase Records. Click New > Purchase Record to launch the Create New Purchase Record Wizard. PO Number: Specify the purchase order number or invoice number associated with the software product purchase. If you don’t have PO or invoice for this product, use any number. Order Date: Select the date the software was purchased. Recipient - Reseller: These fields are optional. You can use them to further identify the purchase record. Click Next to display the Summary page. Select the Define Additional Properties box, then click Finish to create the purchase record and display its Purchase Details page. Product: Click to browse for and select the catalog product you created in Step 2. Quantity: Specify the quantity of product purchased. For example, if the catalog product you selected is ProductA 10-Pack and the purchase order was for 5 ProductA 10-Packs, specify 5. Unit MSRP - Extended Price: These fields are required. Specify the manufacturer’s suggested retail price (MSRP), the price you paid per unit, and the extended price. If you leave the Extended Price field blank, the wizard populates it by multiplying the Purchase Quantity and the Unit Price. Invoice # - Comments: These fields are optional. You can use them to further identify the purchase. Continue with the next section, Creating a Licensed Product. Asset Management can also import purchase information from electronic files. During the process, the purchase record is created as well as any catalog products for software products included in the purchase record. For more information, see License Compliance in the ZENworks Asset Management Reference. The final step in setting up compliance for the software product is to create a licensed product and associate the discovered product and catalog product with it. Doing so populates the license product with the installation and license information needed to determine its license compliance status. The following steps explain how to use the Auto-Reconcile Wizard to create the licensed product and associate the discovered product and catalog product with it. In the License Management panel, click Licensed Products. In the Licensed Products panel, click Action > Auto-Reconcile: Create Licensed Products to launch the Auto-reconcile Wizard. Complete the wizard using information from the following table to fill in the fields. Click the Products Specified Below option. In the Select list, select the manufacturer of your discovered product. In the Product field, enter the name of your discovered product. Based on the information you specified on the Discovered Product Filter page, this page should display your discovered product and the licensed that will be created for it. The wizard attempts to match catalog products to the discovered product by comparing the Manufacturer and Product fields. If the wizard was able to match the catalog product you created to your discovered product, the catalog product is listed as well. Select the catalog product to associate it with the licensed product. If the wizard is unable to match the catalog product to the discovered product, you will need to manually assign the catalog product after completing the wizard. Select the folder where you want to place the new licensed product. The field defaults to the current folder (the folder from which you launched the Auto-Reconcile Wizard). To specify another folder, click to browse for and select the folder. The folder must already exist; you cannot use the selection dialog to create a new folder. Every licensed product must have at least one entitlement and license model. An entitlement typically represents a license agreement. In many cases, a licensed product might have only one entitlement. However, by allowing multiple entitlements, you can determine compliance for a licensed product that has several license agreements. For example, you might have a full license agreement and an upgrade license agreement for the same product. Rather than creating two separate licensed products for the same product, you create one licensed product with two different entitlements. The license model determines how the licenses are counted. Licenses can be counted per installation, user, or device. For this scenario, specify Per-Installation as the description and select Per-Installation as the license model. This causes each installation of the product to consume a license. If you haven’t done so already, click Finish to create the licensed product and add it to the Licensed Products list. Click the License Entitlements tab. In the Entitlements panel, click the entitlement. Click the Proof of Ownership tab. In the Catalog Products panel, click Add. Select the catalog product, then click OK to add it to the Catalog Products panel. The Catalog Products panel displays the catalog product’s Purchase Quantity, which is the number of units of the catalog product that you’ve purchased (according to the purchase record). It also displays the License Quantity, which is the total number of licenses included in the purchased units. Continue with the next section, Viewing Compliance Data, for information about monitoring compliance. There are two views you can use to see the compliance status of your licensed products. You can view the Licensed Products page to get a compliance status summary for all products, or you can generate the Software Compliance report to see more detailed information. In the License Management panel, click Licensed Products to display the Licensed Products page. The software product is properly licensed. The number of purchased licenses equals the number of installations. The software product is over licensed. There are more purchased licenses than installations. The software product is under licensed. There are fewer purchased licenses than installations. In the License Management panel, click License Management. In the License Management Standard panel, click Software Compliance. In the panel, click Compliance Report. A report appears showing compliance data by license. You can filter the data by compliance status, manufacturer and value, or demographic criteria. Drill in to License Quantity to see compliance details for a particular licensed product. For information on other, see the ZENworks Asset Management Reference. The scenario described in the previous sections shows only a small portion of the license compliance functionality available in ZENworks Asset Management. For more information, see License Compliance in the ZENworks Asset Management Reference.